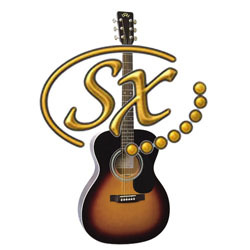 SX guitars offer great sound and excellent quality. The range features acoustic, electro-acoustic and electric guitars that are perfect beginner instruments. SX has the right guitar at the right price for every player. The SX acoustic range features D model, small body and cutaway guitars with great specifications including good quality diecast machine heads and rosewood effect fingerboards. The acoustic kits have everything a beginner could need to get playing and electro-acoustic kits come with a proper acoustic amplifier. SX electric guitars have SC, TC, LP and SG models as well as bass guitars. With features including maple necks, rosewood effect or maple fingerboards and quality pickups, SX guitars don't just look good, they sound good too.